The charm of a city lies not only in its public buildings and attractions, but also in its residential areas. San Diego has many fine ones, each with its own special atmosphere. Just a few blocks from Shelter Island, La Playa ("the beach") is one of the best. The special charm of La Playa lies in its quiet, elegant serenity. Its homes, whether built in the 1920's or the 21st Century, reflect the pride and care of their owners. 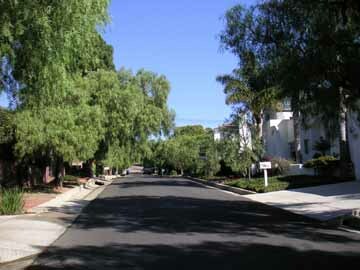 Its lawns and gardens are beautifully kept, and unlike most areas of San Diego, it is blessed with many trees. Although only a few minutes from downtown, La Playa provides a sanctuary from the noise and bustle of city life. 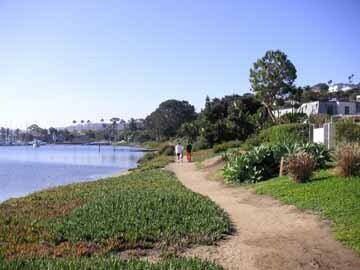 A walk along its beach and its tree-shaded streets is a rewarding and relaxing experience. Begin your walk through residential La Playa at the corner of Scott and Bessemer Streets. Bessemer Street is the sole reminder of what was once to be a steel plant on Point Loma. In 1889, a Pittsburgh steel magnate decided that Point Loma would make a good spot for his West Coast operations. The ore would be brought up for processing from Baja California, Mexico. But before operations ever got beyond turning out a few nails, he died. His successors, deciding that Point Loma was not a good location after all, closed the plant. Follow Bessemer Street down to the water. The lee created by Shelter Island makes a superior boat harbor. 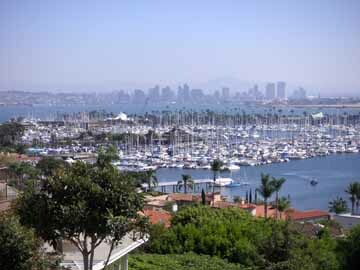 To your left, beyond a white picket pier, is the San Diego Yacht Club, and to your right, the Southwestern Yacht Club. 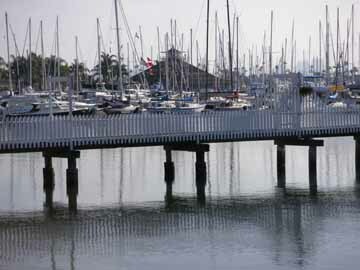 From 1987 to 1995, the San Diego Yacht Club was the home of the America's Cup yachting trophy. Walk to the right, along the path that runs beside the beach. As you walk along, enjoying the harbor and the waterfront homes, take a moment to picture what this shore looked like in the second quarter of the 19th Century. At that time the San Diego economy was based on cattle-raising, and La Playa was the center of the hide and tallow trade. Along the shoreline, hot beef fat was being converted into tallow in large iron kettles. Hides were being soaked in San Diego Bay, pickled in vats of concentrated brine, and then stretched out to dry in the sun. Inventories of cattle hides and tallow were stored in crudely built warehouses along the shore. The hides awaited the ships that would carry them to the East Coast to be converted into shoe leather; the tallow awaited the ships that would carry it to Mexico and Peru to be turned into candles. Later in the century, whaling became an important Point Loma enterprise. On Ballast Point, two miles south of La Playa, bubbling try-pots rendered blubber into whale oil (to be sold for lamp fuel) and men bundled and stored whalebones (to be sold for corset stays). In a few minutes the path ends at San Antonio Avenue. 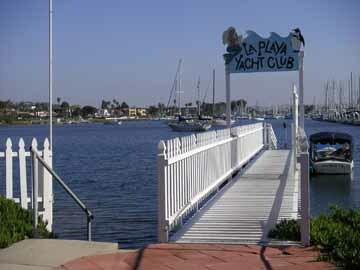 As the path meets the road, you will see on your left a small white wooden pier, graced by a charming sign proclaiming it La Playa Yacht Club. Since the pier is so small, you might assume that the name is simply a humorous gesture, but in fact this is an actual yacht club, composed of approximately 75 families that currently live (or formerly lived) in this neighborhood. San Antonio Avenue is a residential street that in a few blocks brings you back to the water's edge. 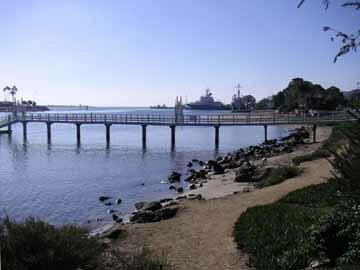 A waterfront path now leads you under a wooden pier around to a small beach. Depending on the tide, you have a choice between walking along San Antonio Avenue and walking along the beach. In either case, turn right at Kellogg Street, where the beach ends. 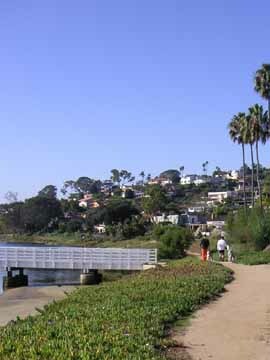 When you reach San Elijo Street you are entering the most secluded section of La Playa. Turn right at San Fernando Street, lined on both sides with pepper trees whose graceful branches and feathery leaves arch across the road. Hidden by the lush foliage, the homes here are examples of understated luxury. Turn right at Owen Street, then left at San Elijo Street. This block of San Elijo is steep, but it makes possible the fantastic views along the rest of the walk. San Elijo Street stops at Rogers Street, but a footpath on city-owned land takes you across to Armada Terrace. To find the footpath, walk up the driveway to your left about ten yards, and you will see the footpath on your right. Walking along Armada Terrace, you have numerous great views of the city and bay. Armada Terrace eventually intersects Bessemer Street, where you turn right. In two blocks you are back to your starting point.